When you go to “Help” in the main menu in Xubuntu Firefox will launch and bring you to an offline documentation page where users can learn the basics. 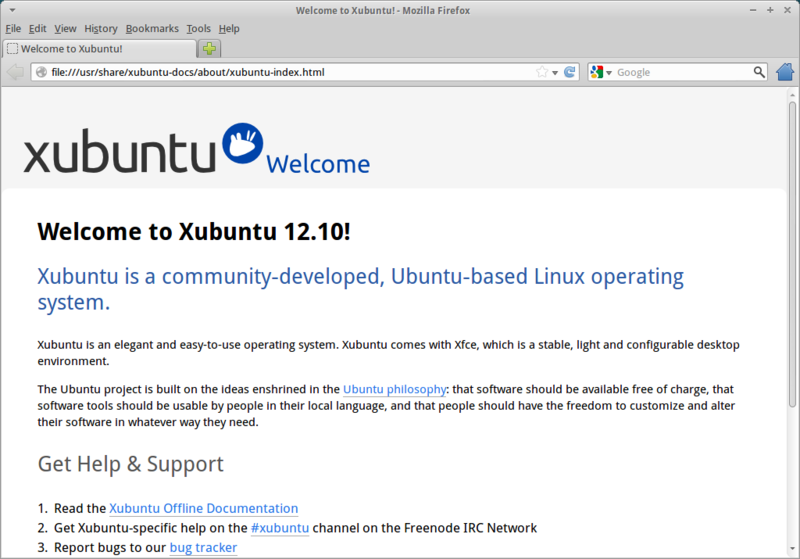 After a couple of cycles without updates, the Xubuntu team worked hard this cycle to take a fresh look at the documentation. The team spent time reorganizing the structure, updating to reflect current default applications and in many cases completely rewriting whole sections. The look was also refreshed to reflect the current style and branding that the project has adopted. Pasi Lallinaho (knome) for leading up the effort in lieu of a formal Documentation Lead this cycle. Pasi also contributed directly to the documentation itself, tracked reviews, updated documentation branding, converted everything back into DocBook and worked with the Ubuntu Doc team to get the documentation uploaded and released before the documentation freeze. Elizabeth Krumbach (lyz) for setting up, hosting and maintaining the wiki that was used by the team during the rewrite and coordinating some of the work between volunteers and the Ubuntu Doc team. Sean Davis (smd-seandavis), Jack Fromm (jjfrv8-gmail), Kev (elfy) and Jay van Cooten (skippersboss) for their extensive edits both the writing of the documentation and efforts during the rushed review process. The work of a documentation writer is never truly finished! The team has already defined several areas where we’d like to improve upon the documentation for the 13.04 cycle, including: improvements to packaging, translations support, routine documentation review and expanding some of the shorter sections. To see the complete and current list of things we are planning to improve even further, see our documentation blueprint for the R cycle. If you want to help us with the planning, want to take part in the discussion or want to get your hands dirty when it’s time to work again, subscribe to the blueprint, apply to the xubuntu-doc Launchpad team and be in touch with us (see the starting points at Get Involved)!